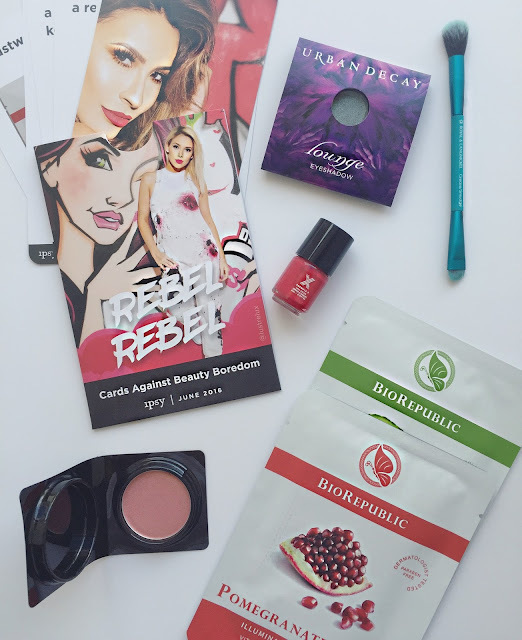 This box was fun and featured two of my favorite beauty youtubers, Katy and Desi, I love when I see these beauty vloggers collaborating with companies. So inspiring! I would say I was not a fan of the makeup brush in this month's bag. But no shade, I can't hate on them because just a couple of months ago they sent me a new favorite brushe from Luxie Beauty. I did love the Biorepublic sheet masks, they are great for making your skin feel soft and plump! I use them the night before I want a really good makeup day. The Urban Decay duo chrome shadow I was definitely a fan of, I mean its small but so cute. Urban Decay has some really great products, not to mention my very favorite concealer! I will have to be honest and let you know I never get around to trying the nail polishes because I always get my nails "did". Yep. I loved this box and everything in it. Let me start by raving about this smaller brand evologie, I have been using this blemish serum for a few weeks and this stuff is amazing. I love a skin product that really shows improvement like this little sucker. Not only does it help your blemish disappear, if you tend to get hyper pigmentation like lucky old ME... it helps with evening out that skin tone too! The modster eye liner is creamy and highly pigmented, works great for smudging and creating a fun smokey eye. Oribe, does it even need an introduction? While their products are a tad pricey, they are bomb! I love using this texture spray to help on days I'm going for the loose waves and effortless looking hair, HA effortless. I WISH! 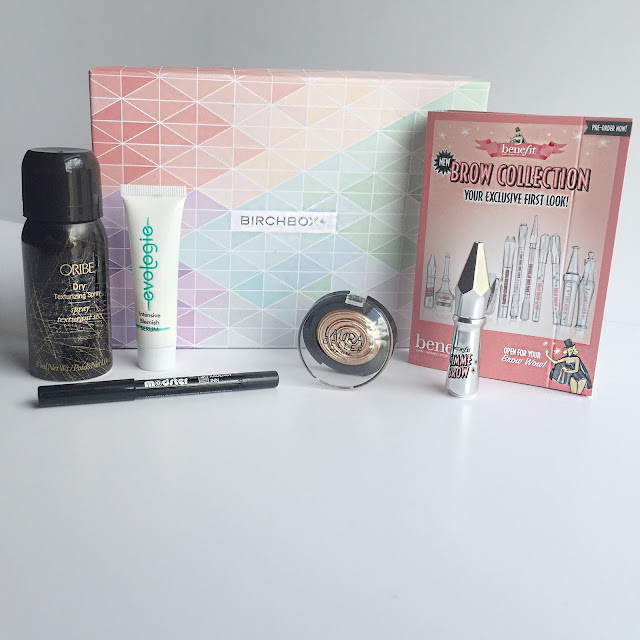 Now to the last two products that I loved from this box, Laura Geller Gilded Honey highlight and the new Benefit Cosmetics Gimme Brow gel. The highlight will give you the perfect glow, they have four shades available and all of them are gorge, I mean don't you love options? Gimme Brow gel is great for adding some extra volume to your brows. I fill by brows with ABH brow powder and have been using this gel to thicken and set my brows. Benefit cosmetics, can you get any cuter with your packaging?! I love all there stuff, I just want to buy it and display it all over my room! Baking has become popular among makeup lovers. It's a great way to lock your makeup into place. I tend to lightly set my face with a loose powder to help my makeup stay put and last longer. Living in Houston with this crazy humidity makes setting your concealer and foundation crucial. You do not want your concealer to move around or your contour to look blotchy. These are my top two favorite loose powders!! Cote Airspun powder is inexpensive, and you can find it at your local drugstore. It's been around long before I was. I honestly love this loose powder but the only downside is it has a pretty strong perfume scent. 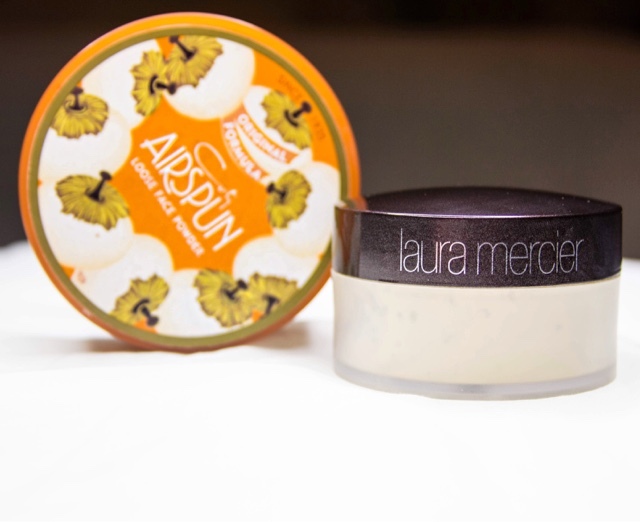 My holy grail loose powder, hands down, is Laura Mercier's translucent setting powder! It is so finely milled and doesn't settle in your creases. It's my absolute favorite for setting my under eyes!